do it – the exhibition between actualization and virtualization, repetition and difference. Originally published in conjunction with the traveling exhibition, conceived and curated by Hans-Ulrich Obrist, “do it”, has finally arrived in Vegas with a unique twist. You have been awarded 100 conceptual dollars to spend in the fabulous resort city of Las Vegas. What happens to the money is entirely up to you, so there is no need to be shy, you are in Vegas!!! 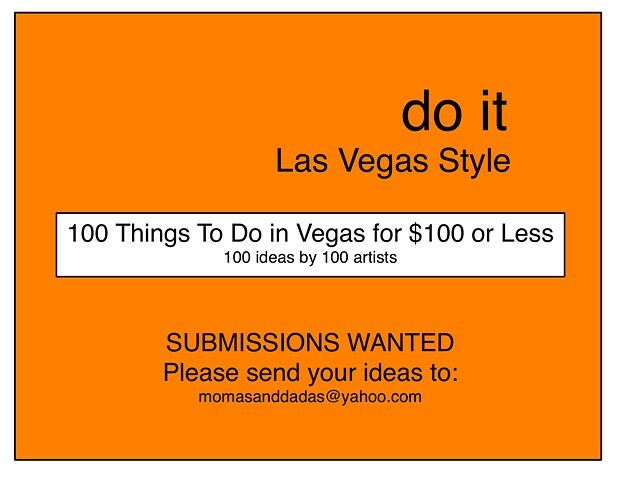 The collection of 100 things to do, will be published via blurb, (paperback & e-book) and available through their online library, making it a great tool for those navigating Las Vegas with an artist’s perspective and budget. From the 100 ideas, 10 will be performed by an unknown person in real time, documented via video/photographs, and included in an exhibition and additional dvd/book combo. Remember…you only have 100 bucks to blow! *All proceeds will be donated to the American Cancer Society.